The charged tip of a scanning tunneling microscope and an additional magnetic field lead to localized stable electron states in graphene. When confined to small spaces, electrons exhibit their quantum properties. Extremely small quantum dots in graphene have been developed by Scientists from TU Wien (Vienna), Manchester and Aachen. In comparison to their counterparts in free space, electrons display different behavior when placed in a tiny quantum prison. Electrons can only occupy discrete energy levels, similar to those in an atom, and because of this reason such electron prisons are often known as “artificial atoms”. Artificial atoms could also possess additional characteristics not available in standard atoms, and they could also have the potential to be used in quantum computing and various other applications. Artificial atoms present in the carbon material graphene possess these additional features. The journal “Nano Letters” features a report on these results. This research was a joint venture of scientists from the University of Manchester (GB), RWTH Aachen (Germany) and TU Wien (Vienna, Austria). “Artificial atoms open up new, exciting possibilities, because we can directly tune their properties”, says Professor Joachim Burgdörfer (TU Wien, Vienna). The possibility of trapping electrons in tiny spaces has already been proven in semiconductor materials, such as gallium arsenide. These structures are often known as “quantum dots”. Electrons present in these quantum dots are forced to move into discrete quantum states, which is similar to an atom, where the electrons are capable of only circling the nucleus on specific orbits. Several other fascinating possibilities have been brought into light using graphene, a material comprising one layer of carbon atoms, which has recently gained major attention. In most materials, electrons may occupy two different quantum states at a given energy. 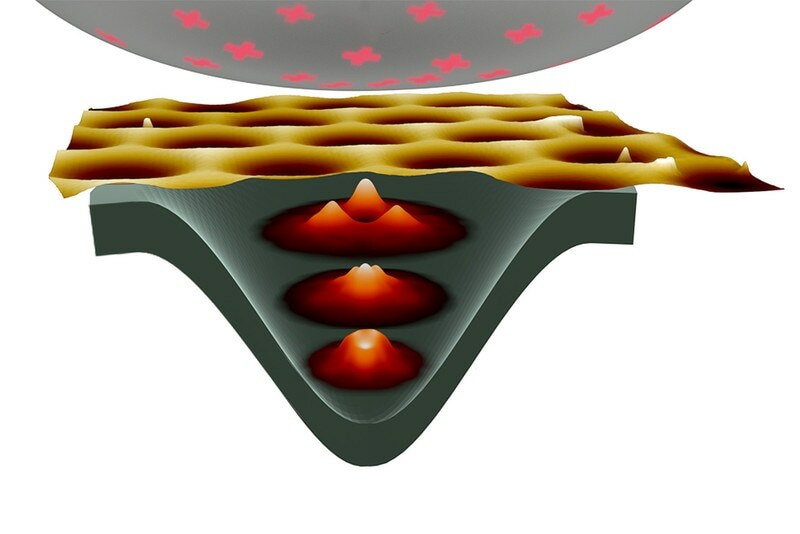 The high symmetry of the graphene lattice allows for four different quantum states. This opens up new pathways for quantum information processing and storage. However, developing precisely monitored artificial atoms in graphene was an extremely challenging task. Artificial atoms can be developed a number of ways, and the simplest of which is to place the electrons into small flakes, cut out of a thin layer of the material. This works well for graphene, however, the material’s symmetry is broken by the flake’s edges which are not perfectly smooth. As a result, the specific four-fold multiplicity of states in graphene is brought down to the standard two-fold one. Different ways had to be discovered: It is not necessary to use small graphene flakes to capture electrons. A much better choice is to use intelligent combinations of magnetic and electrical fields. An electric field can be locally applied using the tip of a scanning tunneling microscope. With this method, a tiny region is formed within the graphene surface, where low energy electrons can be captured. The electrons are simultaneously forced into small circular orbits through the application of a magnetic field. “If we would only use an electric field, quantum effects allow the electrons to quickly leave the trap” explains Libisch. Measurement of the artificial atoms was carried out at the RWTH Aachen by Nils Freitag and Peter Nemes-Incze in the group of Professor Markus Morgenstern. Simulations and theoretical models were developed at TU Wien (Vienna) by Larisa Chizhova, Florian Libisch and Joachim Burgdörfer. The team around Andre Geim and Kostya Novoselov from Manchester (GB) developed the exceptionally clean graphene sample. These two researchers were awarded the Nobel Prize in 2010 for developing graphene sheets for the very first time. Four localized electron states with the same energy allow for switching between different quantum states to store information. The electrons are capable of preserving arbitrary superpositions for a prolonged period, which are ideal properties for quantum computers. In addition, the new technique also has the immense benefit of scalability, which highlights that it should be possible to place several artificial atoms on a tiny chip so that they can be used for quantum information applications.